As many of you know, my time here is nearing its end, as I will be leaving for a new role as president of the University of Northern Colorado (UNC) at the end of June. The reason I was first drawn to SJSU as deputy provost in 2013 was because I saw tremendous potential in every student, every faculty and staff member, and the university as a whole. I have worked during the past five years with many Spartans who have exceeded my expectations and shown me what we can achieve when we work collaboratively toward the same vision. I am fortunate, too, that you saw potential in me when I was selected to be provost less than a year into my tenure. Together, we have made great strides in improving graduation rates and expanding support for research, scholarship and creative activity. We have started professional development and onboarding programs and established student success centers in every college. We have created an Office of Diversity, Equity and Inclusion as well as student centers to support underrepresented minority and undocumented students. While I am pleased with our collective accomplishments, I am also proud of the individual achievements of our students, faculty and staff. During my time as provost, I have especially enjoyed the regular notes I receive from deans, chairs and others sharing accolades for our talented and distinguished people who constitute our university community. Whether I am meeting with people in person, checking email on my cell phone or looking through messages on a laptop, hearing about good news is a highlight of my day. Here are just a few of the items shared with me in recent weeks. Alumna and former Spartan Daily reporter and city editor Mary Callahan made the list of 2018 Pulitzer Prize winners — she was part of the news team at the Santa Rosa Press Democrat that received the award for breaking news reporting for coverage of the Sonoma wildfires. Assistant Professor Minghui Diao was awarded a National Science Foundation grant to study ice supersaturation and its role on climate. Amy Strage, the director of our Center for Faculty Development, was named a faculty fellow with the Transforming STEM Teaching Faculty Learning Program. Professor and Director of the Burdick Military History Project Jonathan Roth coordinated a symposium on culture and WWI. This month’s newsletter highlights more students, faculty and staff who excel in their fields and enhance the reputation of our great university. Read on to learn about an associate professor of English who received a Fulbright Award; students who will represent SJSU at the CSU Student Research Competition in May; a team of educators who are tackling ways to promote online civic literacy; two staff members who are co-chairing the Spartans Supporting Spartans campaign; a graduate student who was invited to participate in a panel on gentrification at the Chicago Ethnography Conference in March; and view photos from our April 20th Honors Convocation. These and many other Spartans are what I will miss most about San Jose State University. The relationships I have built since my arrival are the thing I hold most dear about my time here. I want to reiterate that I have learned so much from all of you, and I am honored to have been part of your journey. 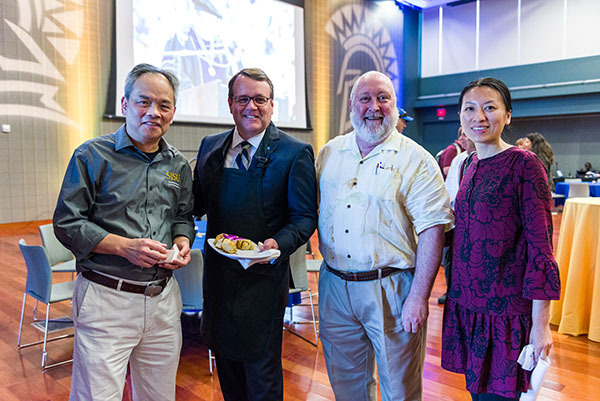 I know I will connect with many of you during my final months at SJSU and I hope to see many of you at my farewell reception that President Papazian will host from 3 to 5 p.m. May 7 in the Diaz Compean Student Union Ballroom. As you have recently read, I will be departing San Jose State University at the end of this academic year and will be taking on the role of president of the University of Northern Colorado. While I am excited for the new opportunities this appointment will provide for myself and my family, I am also saddened to be leaving the university and community I have called home for the past five years. I love this university and our students, staff and faculty! I joined SJSU as deputy provost in 2013 because I saw tremendous potential in every student, every faculty and staff member, and the university as a whole. I hold dear the relationships I have built since my arrival. I have learned so much from all of you, and I am honored to have been part of your journey. I arrived at a challenging time when our campus was dealing with issues of shared governance and a deep budget deficit. I was pleased to find a community of faculty and staff members who were willing to tackle these trying times head on while remaining focused on our mission of supporting students. We have accomplished so much in the past five years through collaborations with the Academic Affairs Leadership Team, the President’s Cabinet, faculty and staff, and, of course, our students. Under President Papazian’s leadership, I know that we are heading in the right direction and the university will continue its forward progress on top priorities. As I think about leaving, there are many people who I wish to thank in person, and we will find some time later in the spring to come together and celebrate. I would particularly like to thank the Academic Senate Executive Committee members, who have become not just colleagues, but friends. I can’t count the number of times I walked down the hall in the Administration Building into the Academic Senate chair’s office to ask for insight and advice—Lynda Heiden, Michael Kimbarow and Stefan Frazier have all offered an open door to me and I’ve offered the same to them. I am also grateful for the dedication of the Academic Affairs Leadership Team, the deans and members of the President’s Cabinet with whom I have worked so closely. My fondest memories of San Jose State will always be my interactions with students. In my first semester as provost, I visited many classrooms to learn more about our students. Most recently, I have had the pleasure of working with Ariadna Manzo, our Associated Student president, who demonstrated tremendous courage in terms of sharing her personal story as an undocumented student in an effort to advocate for others. Students like Ariadna led to the creation of the African American/Black and Chicanx/Latinx student success centers and the UndocuSpartan Resource Center. I am also pleased to see the progress our campus has made on diversity and inclusion. 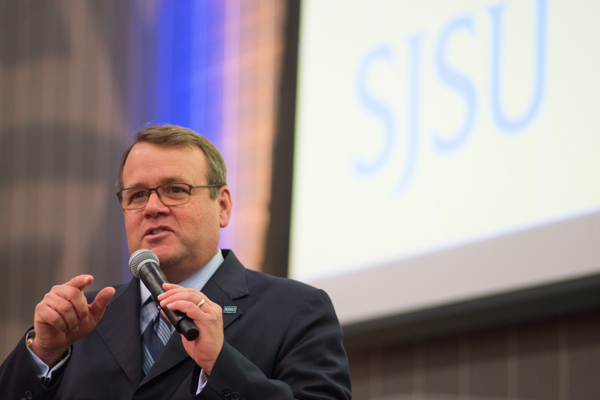 Through the creation of an Office of Diversity, Inclusion and Equity and other initiatives, I know San Jose State will continue to honor its social justice legacy. I will miss having my Sparta salad at In the Mix, soup at New Tung Kee Noodle House, and breakfast at Peanut’s, where I always knew I would run into someone from campus. Thank you very much for the opportunity to serve this wonderful institution. Go Spartans!